As we come to the conclusion of our Heroes & Villains previews, today’s spotlight is on Heroic Assistance and Villainous Empowerment. With an Ultra Rare ratio of 1:48 packs, players will have more opportunities to try out these uniquely powerful cards. Heroic Assistance allows targeted recuperation, which is seldom seen. Unlike other cards that access the discard pile, Heroic Assistance is not banished after use. 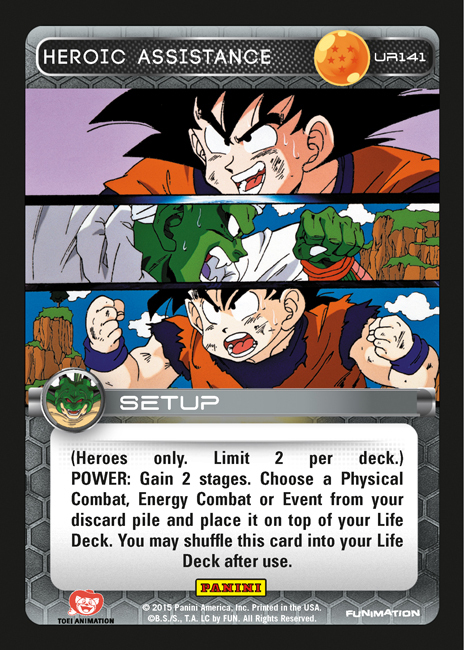 In fact, you even have the option of putting it directly into your Life Deck! In the endgame, it remains useful as a means of setting up a turn to push through lethal damage. Villainous Empowerment has an equally gaudy suite of valuable effects. Aside from conditional interactions, it is the only Freestyle card in the game that searches for a drill. Utilizing this effect with cards like Black Smoothness Drill will be a powerful new avenue for Villain based control decks. Along with the noteworthy Endurance and ability to blank the board when appropriate, its overall utility cannot be underestimated. You’ll be able to sit down with these URs up close and personal on March 6th. Check the Store Locator for launch events in your area, and tune in later this week for a full checklist. Finally, be sure not to miss the box breakdown coming next week. Spoiler warning: the foils will leave you astonished.